Granulocyte colony stimulating factor (G-CSF) is a member of the colony-stimulating factor hematopoietic cytokine family (Cavalcante et al. 2015). Similar to other cytokines, G-CSF plays a critical role in the immune response to infection. 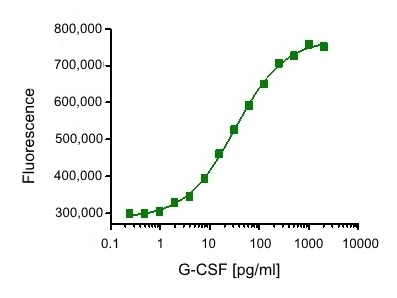 G-CSF is expressed by a number of cell types including monocytes, macrophages and fibroblasts (Panopoulos and Watowich 2008). Protein levels are low in healthy individuals however increase significantly upon inflammatory stimuli such as interleukin 1 and TNF-alpha (Christensen et al. 2016, Panopoulos and Watowich 2008). G-CSF regulates neutrophilic granulocytes by stimulating neutrophil proliferation, differentiation, survival and also plays a key role in neutrophil mobilization into the bloodstream (Cavalcante et al. 2015). 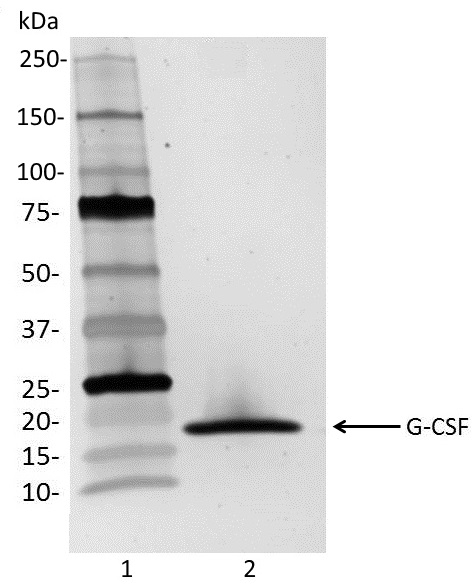 G-CSF signaling is mediated by binding to the G-CSF receptor (G-CSFR, CD114 in humans), which is expressed by a number of cell types including myeloid leukemic cells, mature neutrophils, platelets, monocytes and cardiomyocytes (Panopoulos and Watowich 2008). Upon ligand binding, G-CSFR dimerizes, which results in receptor phosphorylation and subsequent activation of a number of cell signaling pathways, including JAK/STAT and Ras-MAPK signaling pathways (Tamada et al. 2005, Avalos 1996). As a result of chemotherapy, cancer patients commonly develop neutropenia (Crawford et al. 2004). G-CSF is the active ingredient of drugs used to treat chemotherapy associated neutropenia (Lustberg 2012). G-CSF exacerbates inflammatory conditions such as rheumatoid arthritis; Eyles et al. (2008) suggest modulation of G-CSF as a potential therapy route. The proliferative effect of G-CSF was demonstrated by performing a cell proliferation assay with NFS‑60 mouse myelogenous leukemia lymphoblast cells. The expected ED50 for this effect is 10-70 pg/ml. Centrifuge vial prior to reconstitution. Reconstitute to 500 μg/ml by adding 20 μl ddH2O. Care should be taken during reconstitution as the protein may appear as a film at the bottom of the vial. Bio-Rad recommend that the vial is gently mixed after reconstitution. Do not vortex. Centrifuge vial prior to reconstitution. Reconstitute to 500 µg/ml by adding 200 μl ddH2O. Confirmed by performing an alamarBlue® based cell proliferation assay using mouse myelogenous leukemia lymphoblast cells. The expected ED50 for this effect is 10-70 pg/ml. Avalos, B.R. (1996) Molecular analysis of the granulocyte colony-stimulating factor receptor. Cavalcante, M.B. et al. (2015) Granulocyte colony-stimulating factor and reproductive medicine: A review. Iran J Reprod Med. 13 (4): 195-202. Christensen, A.D. et al. (2016) Granulocyte colony-stimulating factor (G-CSF) plays an important role in immune complex-mediated arthritis. Eur J Immunol. 46 (5): 1235-45. Crawford, J. et al. (2004) Chemotherapy-induced neutropenia: risks, consequences, and new directions for its management. Eyles, J.L. et al. (2008) A key role for G-CSF-induced neutrophil production and trafficking during inflammatory arthritis. Lustberg, M.B. (2012) Management of neutropenia in cancer patients. Clin Adv Hematol Oncol. 10 (12): 825-6. Panopoulos, A.D. & Watowich, S.S. (2008) Granulocyte colony-stimulating factor: molecular mechanisms of action during steady state and 'emergency' hematopoiesis. Tamada, T. et al. (2006) Homodimeric cross-over structure of the human granulocyte colony-stimulating factor (GCSF) receptor signaling complex. Proc Natl Acad Sci U S A. 103 (9): 3135-40.